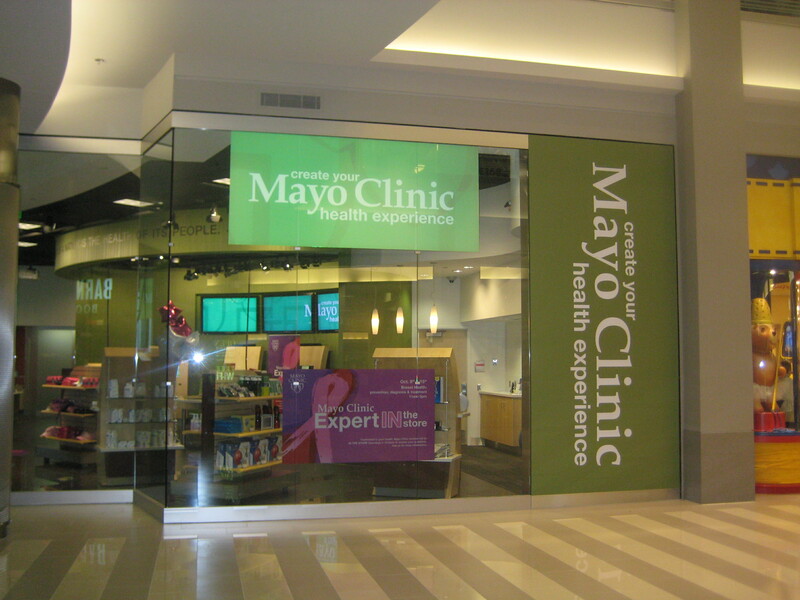 My first visit to Mayo wasn’t so much window shopping as it was a technology-based health experience in the making. The first thing the associates had me do was enter my name and e-mail into this table with a screen in it and before I knew it, a card pops out with my name and a QR code. As I was informed, this card gives you access to various health assessments that you can take on your own at one of the several kiosks. As a recent smart phone owner, I was verbally ecstatic to scan said QR code, but was promptly sad-faced when the overhearing sales associate (is that what they call themselves?) told me that the code doesn’t actually go anywhere yet, and that I should go to the Mayo Clinic health experience forum (also on the back of the card) to join the “online community forum”. When I’m shopping, I really don’t want to bother with things like giving my personal information for something that is “still in development” even though I just entered my full name and e-mail address into a counter top. 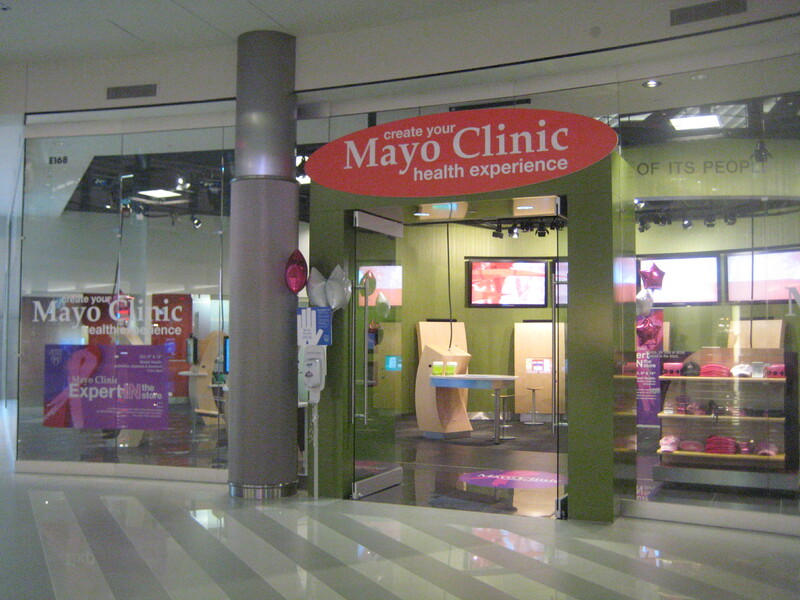 I just want to look at stuff and see how healthy I am – that’s what Mayo Clinic is doing in the Mall in the first place, right? I attempted to swipe my card at a kiosk, and the “technical difficulties” from last time weren’t resolved yet (an associate told me that I need to register my information online in order for the membership card to remember my assessment scores and stuff that I’ve watched and whatever else it is I am supposed to do. Is that lame or is that lame?). But I was able to access the tidbits of information anyway. There were different tabs that featured various videos and things to read about sleeping, relaxing, eating, and so on and so forth. There are tips on how to battle Jet Lag, snoring and other annoying health issues. Heads Up: The videos aren’t closed captioned, which to me is a HUGE no-no at the Mall of America, especially in the Rotunda where there’s going to be all sorts of noise on any given day. Even on quieter days, hearing impaired customers, or folks like myself who just like to read what’s going on are probably missing out on the health tips. In addition, there’s no scroll bar to let you skip to the end, or back to the beginning. Anyhow, my personal favorite feature of the Mayo store is the WebMD kiosk. You tell it your symptoms and it guesses what could be wrong with you besides “You’re carrying too much weight on your shoulders – literally. Put the shopping bags DOWN”. In terms of actual retail, there are plenty of unique items, such as pedometers, yoga workout card decks, and of course, the Vegan Cookbook. “And there’s an entire chapter on Crock-Pot recipes!” exclaimed the associate. Eventually there will be occasions where health experts will be on-site to answer questions about subjects like breast cancer. That’s the View of the Mall for now! Wow! Thanks Kayla! Sounds like there is a tad of tweaking yet to do on the new Mayo store! Shareology can’t wait to find out what you alert us to next at Mall of America! Thanks for the update on the Mayo at the Mall (although when I wrote that, I thought of another type of mayo!). This seems to be the “megamallish” version of Minute Clinic in stores. Do you think there will be regular docs there or is it more for public health information? I look forward to learning more. MinuteClinic has medical staff on site to treat minor ailments. 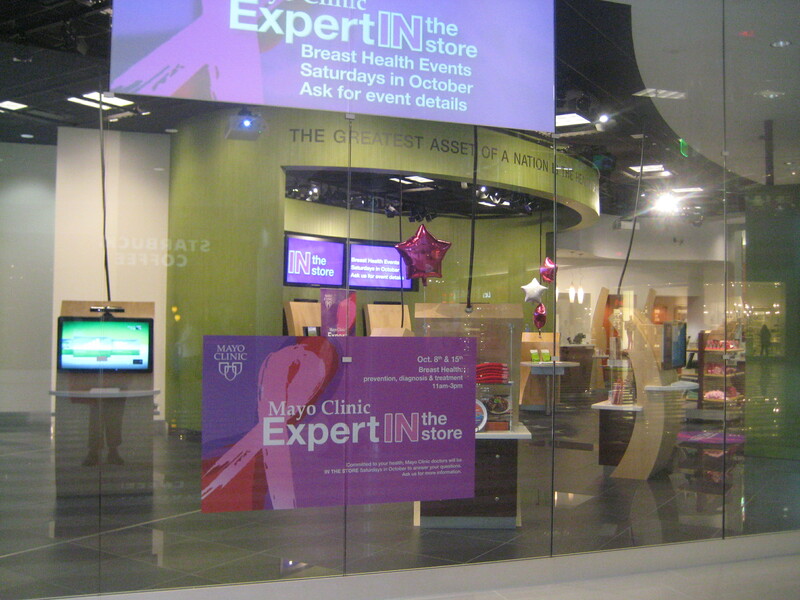 Mayo Clinic is using the MOA store as a branding exercise, staff do not appear to be medical personnel. This is likely Step 1 of a plan; next steps could include MOA — or not.